Mount Taishan is the most sacred of China's five famous holy mountains. It's also renowned for its scenic beauty and 5,000 steps leading to the Taishan summit. Over the course of two thousand years, emperors came to worship on Mount Taishan. 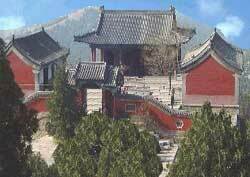 Some built pavilions, the most heralded being Five Pines, which dates back to the Qin Dynasty (221 to 206 BC). Dai Temple at the base of Mount Taishan and Azure Cloud Temple at its peak (see photo) are Mount Taishan's most famous Taoist sites. Despite the steep, lengthy stairs, many pilgrims and tourists make the climb. It takes the average visitor 4 hours up, 2 hours down to conquer the 5,000 steps. If 5,000 steps are beyond your physical endurance, you can take a cable car. It cuts the number of stairs you have to climb in half. It's best to be on the summit to catch Mount Taishan's famous sunrise vista (summit guest houses are available for sleep overs). It's best to be at the foot of the mountain to see the misty clouds serenely dance around the mountain slopes.